River Course at the Alisal presents golfers with breathtaking panoramas of the brilliant hues of the foothills and the Santa Ynez Mountains and Valley. 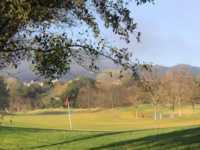 River Course features four lakes and often follows the meandering path of the Santa Ynez River. Gentle mounds define the manicured fairways and bentgrass greens accented by mature live oaks, native sycamores and elderberry trees. Robert Scarpati, PGA Member at the River Course, describes the magnificent course as extremely playable for all levels. At 6,830 yards, the par-72 course is challenging but not punishing. This strategic placement of a variety of hazards rewards length and accuracy without severely penalizing casual and recreational golfers. The moderate central California climate and meticulous maintenance provide excellent year-round playing conditions. The fairways appear wide but mounding along the sides requires accuracy to avoid sidehill lies. Some of the tees are elevated offering sweeping vistas of the fairways below. The greens are large and have moderate undulations making them a delight to putt, and the club keeps them consistent and true.